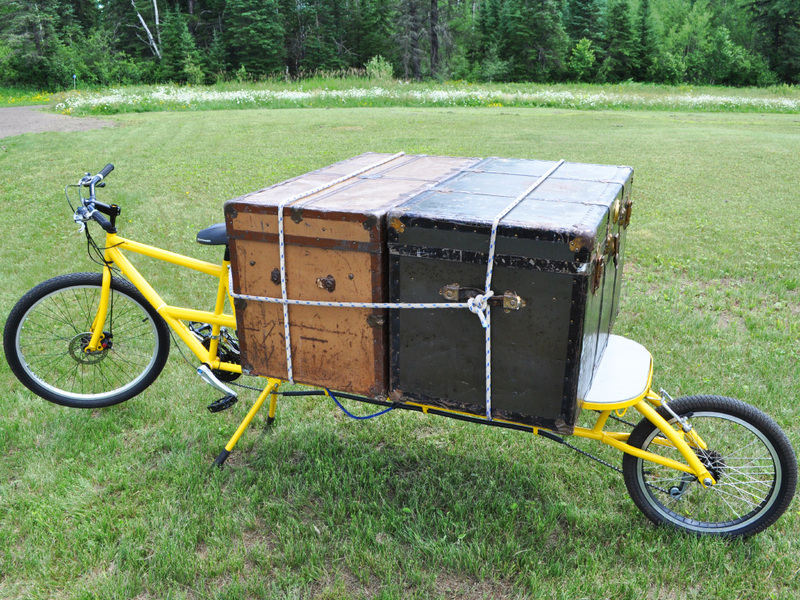 Move The World With This DIY Cargo Bike! 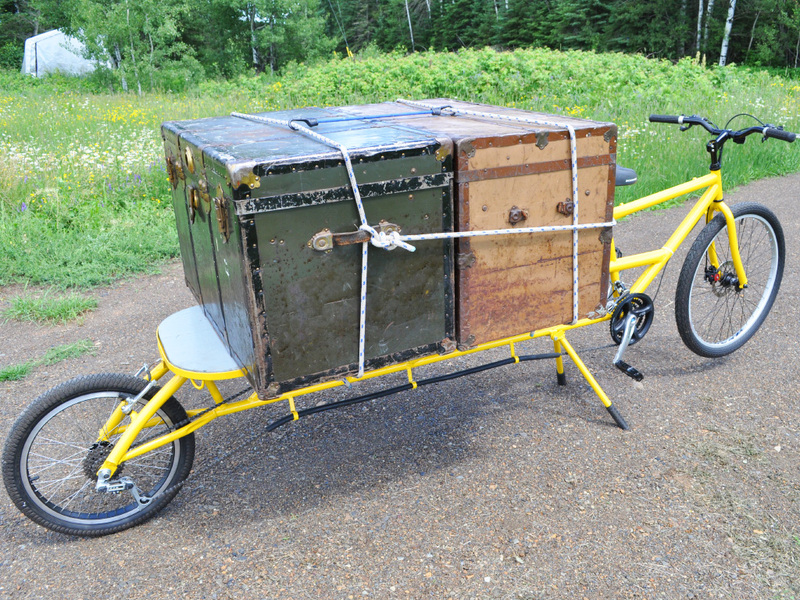 This DIY Cargo Bike will move just about anything you dare pile on to it. Even a few hundred pounds isn't any problem for this capable workhourse. With its configurable flat deck and ultra low gear range, your human engine will be able to move several hundred pounds easily, even up hills or on rough terrain. Some cargo bikes brag about carrying a load of groceries, but this one will move your groceries while they are still in your full size refrigerator! You can build your own heavy duty cargo bike using the parts taken from an old mountain bike, and some hardware store fence tubing. You only require basic tools and skills to make this, with every step shown in great detail in our easy to follow plans. It's Moving Day, Can I Borrow Your Cargo Bike? No problem, just be sure to strap the stove down well using the convenient cable hooks on the flat deck! When you consider what most people move in a pickup truck, then this cargo bike is a real contender, and you can build for the cost of two tanks of gas. 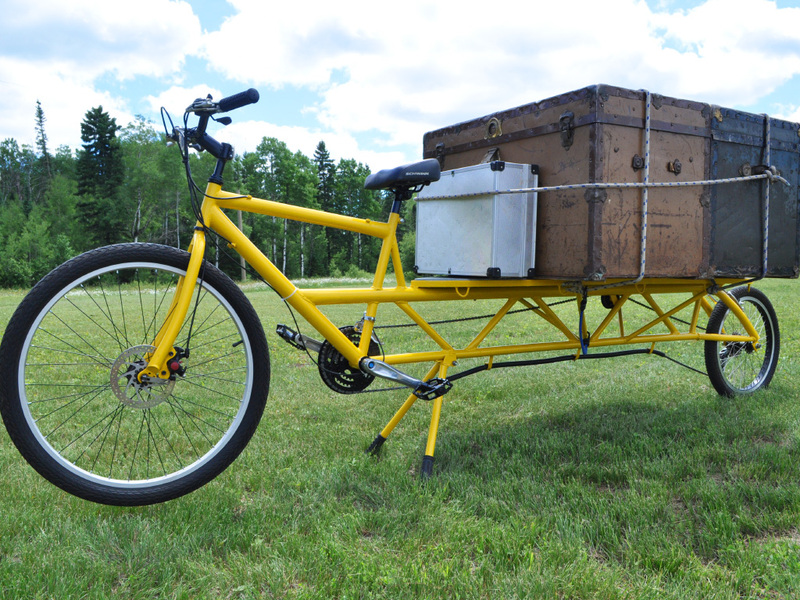 The DIY Cargo Bike Plan is very easy to modify, so you can make the cargo area larger, wider, or even enclosed. You can even make interchangeable cargo boxes. One old mountain bike, a bunch of fence tubing, and few feet of angle iron. That's about all you need in order to create your own heavy duty cargo bike from scratch. You can build a bike like this in a few days using only the most basic tools. Makes a Truck Look Bad! A typical half ton truck weighs 5000 pounds and can carry 1000 pounds. This bike weights 50 pounds, and can move 300 pounds. If you do the math, that makes the Transporter 50 times more capable! The real benefit to using human power is obvious. Save a bundle on fuel costs, keep your legs in shape, drive anywhere you want, and don't add to the noise and air pollution. 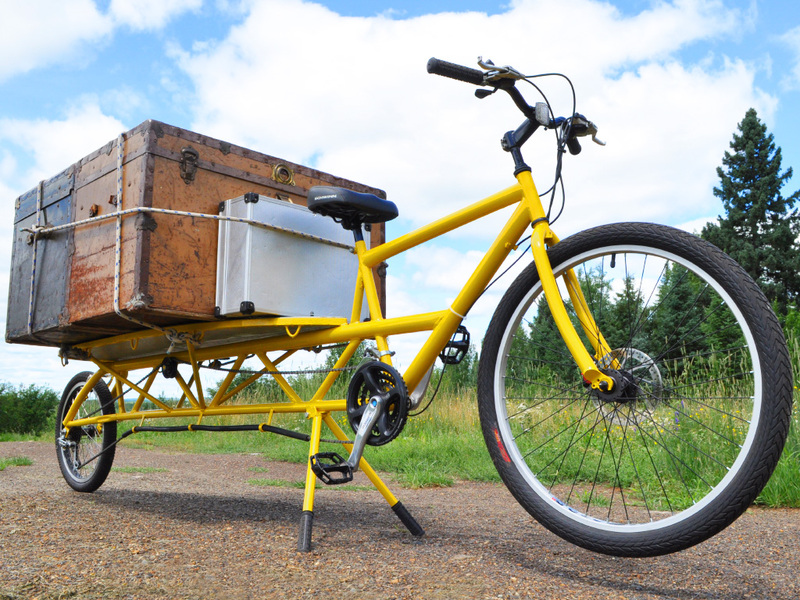 This DIY Cargo Bike would also make a great base for a bike courier business. You could create a lightweight fully enclosed cargo bay and use it in any weather. You can use just about any type of round or square tubing you like to make your cargo bike frame. The plan uses typical electrical conduit and fence tubing used for galvanized fencing, but you can use any type of thin walled tubing you have on hand. The Center Stand Holds Your Bike Stable While Parked. A two wheel vehicle is stable when moving, but when parked, it requires some means of holding it upright. We made a stand for that. The sturdy center stand will hold the bike upright while you load up with your heavy cargo, securing it with rope or ties on the handy hooks placed around the frame. The center stand also stops your heavy loaded bike from rolling away, and then tucks neatly under the frame when you are ready to deliver your cargo. The flatdeck is just one of many possible options available for carrying your cargo. The one shown in the plans includes a steel edge around plywood so that it is both lightweight and virtually indestructible. Treated wood also makes it weatherproof. Rides Like Any Standard Mountain Bike. Everything from the seat up is just as it is on a standard bicycle, so you won't have any problem piloting your cargo bike. Brakes and levers are in the usual place on the handlebars, and they control a full range of gears, including some extra low range for starting and hill climbing. The DIY Plan also details the conversion of a standard front caliper brake to a more robust disc brake in case you intend to take on some downhill riding or fast city deliveries. The chain is routed safely up off the ground and away from any ropes or ties used to hold down cargo. Standard inexpensive hardware store parts are only used for all of the small transmission parts you may require. Nothing on this project is expensive or hard to source. Super Low gear Range For Hill Climbing Power. The smaller 20 inch BMX rear wheel is ultra strong, and increases your low end gear range for that extra hill climbing power. The small rear wheel also keeps your cargo lower to the ground so you can stack it higher and remain balanced as you ride. The main frame uses a trussed design similar to a crane boom, so it is ultra sturdy for its weight, allowing you to load up your cargo bed with out any worries. 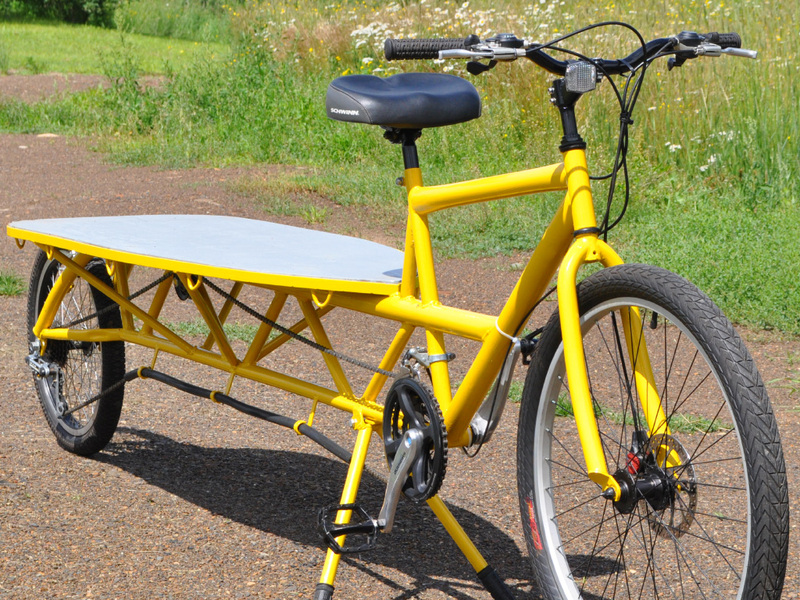 If your legs are willing to crank it, then this cargo bike will take it! Old frame tubing can be utilized in the design so you can recycle what you have on hand. Our DIY Bike Plans always promote changing things up and using the parts you have available, so there is a lot of room for modifications along the way. My Transporter Cargo Bike works like a mule out here in the country, moving firewood, logs, dirt, and groceries from the corner store. With no cargo, it rides like a regular bike as well. Perhaps you intend to start a human powered moving company, or maybe you want to sell wares on the street corner? No problem, there is a lot of room to adjust the cargo area to suit your needs. With some creative design, you could even make this into a human powered camper with a fold out tent and heater! The DIY Cargo Bike Plan shows you how to build everything from the ground up, progressing one step at a time with many detailed photos and text. you are free to adjust the length, shape, and size of just about anything as you complete your build. 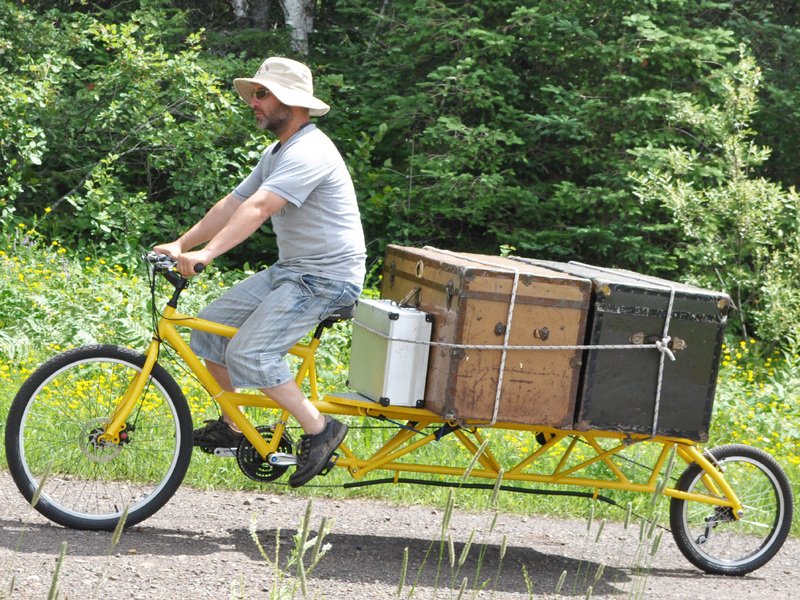 Your DIY Cargo Bike is Always Ready to Work. As cities become more bike friendly, The Transporter Cargo Bike fills that space that used to belong to the heavy, gas guzzling pickup truck, which most of the time is not actually moving anything in the box. 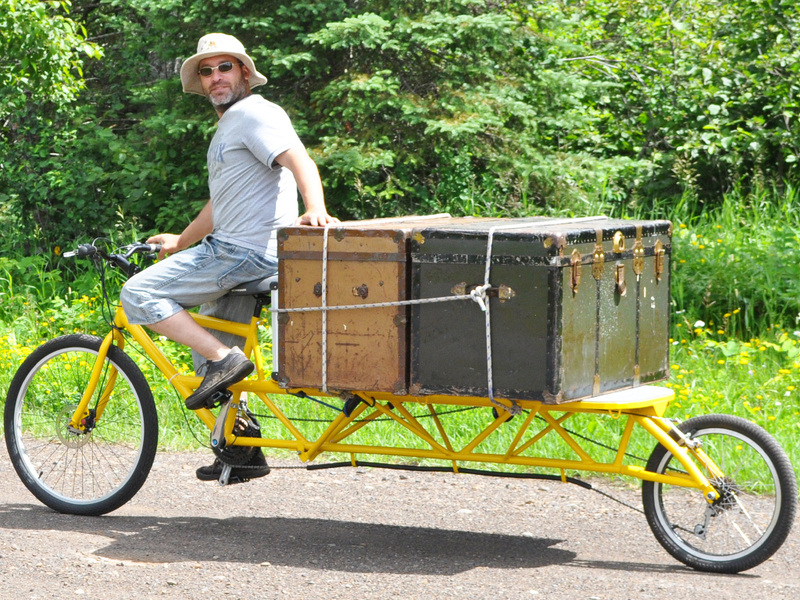 Even as a regular unloaded bicycle, the Transporter rides well, and can be used for daily travels that do not require the moving of heavy cargo. It's multipurpose. Of course, human powered cargo moving is not something for the lazy, and you will certainly get some great exercise. 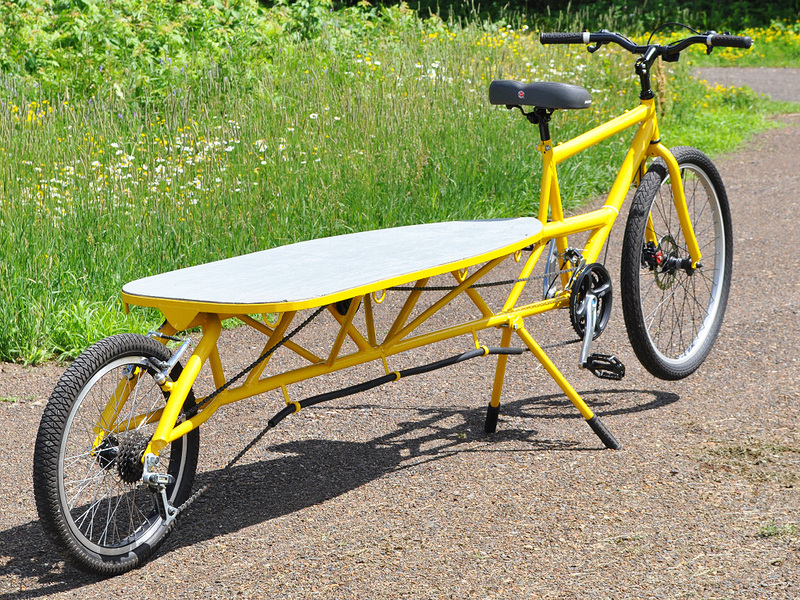 This DIY Cargo Bike Plan is made for anyone, even first time bike builders with no experience. You will only require basic bicycle parts, hardware store tubing, an angle grinder, and any welder. Make it a team effort and now you have a time-shared human powered pickup truck!